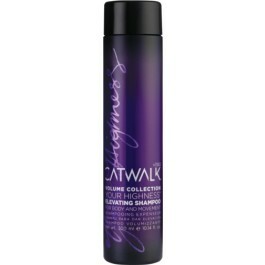 TIGI Your Highness Elevating Shampoo, kun 88 kr. Aqua (Water/Eau), Sodium Tetradecenesulfonate, Cocamidopropyl Betaine, Polyquaternium-44, Glycol Distearate, CocoylDiethanolamide, Sodium Cocoyl Isethionate, Ammonium Chloride, Parfum(Fragrance), Sodium Laurylglucosides Hydroxypropylsulfonate, PPG-2 Hydroxyethyl Coco/Isostearamide, Lauramide DEA, Guar Hydroxypropyltrimonium Chloride, Citric Acid, PEG-8 Dimethicone, PEG-8 Ricinoleate Tetrasodium EDTA, Panthenol, Wisteria Sinensis Extract, Viola Odorato (Violet) Extract, Prunus AmygdalusDulcis (Sweet Almond) Fruit Extract, Lavandula Angustifolia (Lavender) Extract, Helianthus Annus (Sunflower) Seed Extract, Glycerin, Glycogen, Methylchloroisothiazolinone, Methylisothiazolinone, Benzyl Benzoate, Benzyl Salicylate, Gamma.Isomethyl Ionone, Hexyl Cinnamal, Hydroxyisohexyl 3-Cyclohexene Carbonaldehyde, Limonene. Fugt håret og masser grundigt på hår og hårbund. Skyl derefter grundigt. Afslut med Nourishing Conditioner.